The entryway to your home can say a lot about your personal style and the interior decor of your space. If you’re looking for a trendy and affordable way to improve your home’s entryway, consider changing up your light fixtures. Whether you choose a light fixture that makes a bright and bold statement, or a more subtle fixture for a calming appeal, there are many ways to spruce up your home’s interior. At M&M Lighting, we’re proud to be a leading provider of interior and exterior lighting solutions from some of the best manufacturers including Sea Gull, Kichler, and Maxim. If you need assistance choosing the best light fixtures for your home, contact our lighting professionals today. Tiered Chandeliers – The more tiers a chandelier has, the larger it will be. From traditional to modern and rustic styles, there are a variety of stylish tiered chandeliers to choose from for your home’s entryway. Traditional Chandeliers – Traditional chandeliers are often characterized by their unique and ornate detailing. 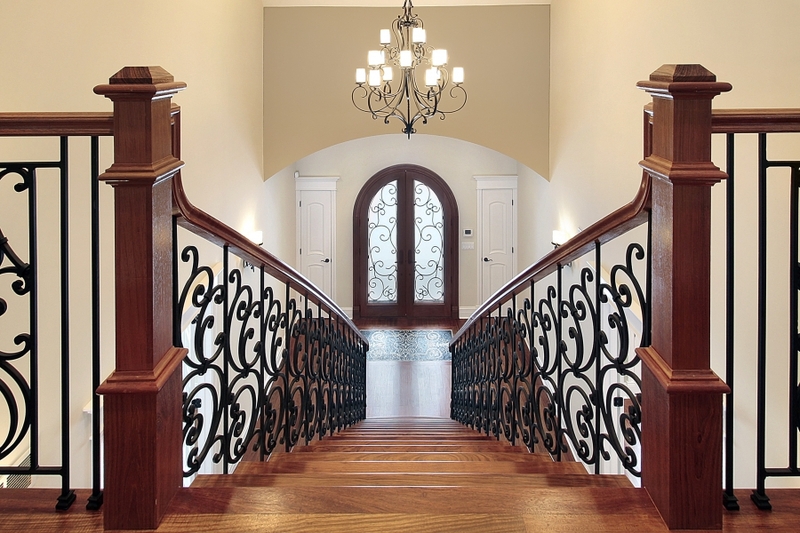 Traditional chandeliers can add formality to your home’s entryway. Crystal Chandeliers – If you’re looking to “wow” guests and visitors that enter your home, consider investing in a crystal chandelier for your entryway. These lights have a glamorous and tasteful appearance as they reflect lift off of each individual crystal. This is a great lighting option for those looking to create a romantic and enchanting environment. Drum Chandeliers – This type of chandelier oftentimes resembles a pendant light. A drum chandelier will feature one or multiple lampshades that surround the entire fixture. At MM Lighting, we offer a unique selection of affordable and stylish drum chandeliers. Browse our selection online today! Transitional Chandeliers – If you’re looking for a chandelier that fits between contemporary and traditional styles, you’ll love a transitional chandelier. With a touch of modern sleekness and ornate designs, these chandeliers can fit in with nearly every interior design style. For modern and traditional entryways, pendant lighting can help add elegance and radiance to your home. This single light fixture is often suspended from the ceiling by a cord, chain or metal rod. With the variety of pendant lights available, you may find it difficult to choose the perfect lighting solution for your entryway. At MM Lighting, we offer a unique assortment of affordable and stylish pendants that will fit the decor and style of any home. Contact our lighting professionals today to learn more about our lighting solutions! Mini-Pendants – As the smallest version of a pendant light fixture, mini-pendants are a great way to illuminate your home’s entryway. A mini-pendant can help you create a new focal point for your entryway, which can be perfect for highlighting pieces of furniture or works of art. Multi Light Pendants – Multi light pendants are light fixtures with multiple hanging lights connected to one central fixture. This type of lighting solution provides a similar look to individual pendants but can be a more convenient option for rooms with only one overhead electrical opening. These light fixtures are often used over dining room tables, kitchen counters, and other work areas as well. Down Light Pendants – This type of pendant directs light downwards and is a great option for task lighting. Up Light Pendants – Up light pendants direct light upwards and can be used for the general illumination of your entryway. They can also help make a small or crowded entryway feel bigger. Drum Pendants – Drum pendant light fixtures have a cylindrical drum shade and can offer a subtle lighting solution to your home’s entryway. The most basic version of this type of light fixture comes in white or natural linen shades. Too add more color or style to your entryway, consider investing in drum pendants with patterned shades or metal accents. 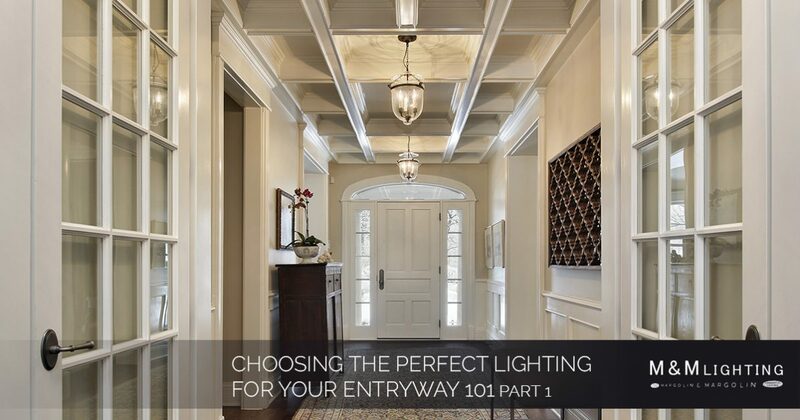 In part two of this series, we’ll discuss some other popular lighting styles to consider for your home’s entryway. M&M Lighting is proud to offer some of the best lighting solutions from top lighting manufacturers including Sea Gull, Kenroy, and Forecast. Order your lights from M&M Lighting today!